The legendary Anna Wintour is one of the all-time most influential figures in fashion and magazine design. Born in London in 1949, Wintour cut her teeth at Harper’s & Queen’s fashion department, before bouncing around editorial gigs in England and New York. She took over as fashion editor at Harper’s Bazaar in 1976 at just 27 years old, and eventually landed another very high-profile gig at New York Magazine in 1981. 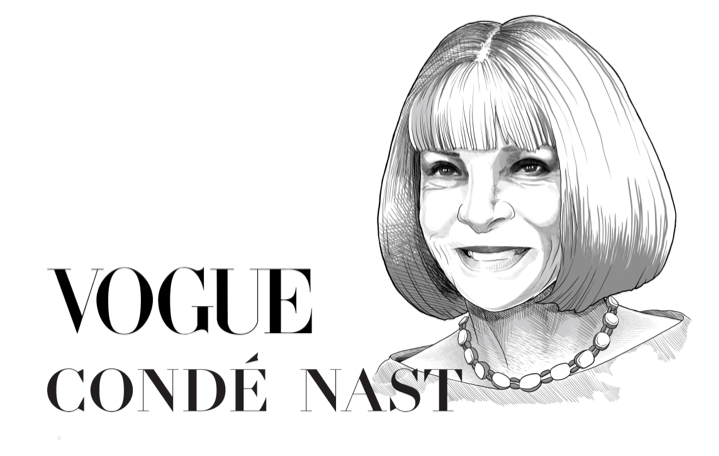 Her involvement with Condé Nast began in 1985, when she took over as editor-in-chief of British Vogue. Her artistic direction was laser-focused on her image of her readers, women interested primarily in “business and money” that had little time to discover their style via shopping and needed to be told in direct terms “what and why and where and how.” The changes that she implemented in pursuit of this vision were very well received, and by 1988 she’d been selected to succeed Grace Mirabella as editor-in-chief of American Vogue. In 2013, after many years as a household name and “celebrity editor,” she ascended to her current position as artistic director at Condé Nast. Wintour’s style as an art director and creative leader has always been concentrated on modernity. Under her reign at Condé Nast, several struggling publications have been transformed by refocusing themselves toward digital innovation and forward-thinking aesthetics. The publisher recently launched Them, an LGBT site, and Architectural Digest launched Clever, aimed at design-minded millennials who may find AD’s content a bit too inaccessible. In recent years, Teen Vogue has shed its juvenile image and grown up into a thought-provoking, sophisticated publication for readers in their late tends through their mid twenties. They famously produce “Wokeletter,” a newsletter that engages subscribers in relevant discussions about the major social issues of our time. As artistic director, Wintour was also involved in the creation of 23 Stories, Condé Nast’s internal agency focused on branded content. The agency made headlines in relevant circles for its decision to use Condé Nast’s editorial staff to write ad copy, in a virtually unprecedented and somewhat controversial move of blending journalism and advertising departments. In addition to her own creative responsibilities, Wintour is credited for fostering the careers of several creative titans across different disciplines, including photographer Annie Leibovitz and fashion designer Tory Burch. Wintour is also a trustee of the New York Metropolitan Museum and spearheads the Met Gala, arguably the most significant event of the year for costume couture. In 2017, Queen Elizabeth awarded Wintour the title of Dame, adding to the many honors she has received over her storied career.